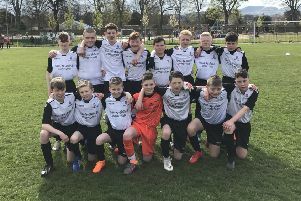 Cavalry Park closed the gap on Intermediate league leaders Bonnyrigg Rose Athletic A to three points with a crushing 7–1 defeat of Polbeth United to give themselves a great chance of winning the LEAFA Intermediate league title. Second place Cavalry have two games in hand over leaders Rose, so will be confident they can usurp Bonnyrigg with seven league games still to play. Strike Cammie MacFarlane gave the home side a 1-0 lead at the break after he lobbed the Polbeth goalkeeper when Gregor Hutchison played him in. Cavalry doubled their lead when Jonny Cowper netted from a corner-kick after the interval. MacFarlane soon notched his second with a powerful strike, before Gav Clark and another MacFarlane effort had Cavalry cruising. Scott Sutherland then completed the scoring with a quickfire double. Tranent moved up to fourth in the Premier Division with a 5-0 defeat away from home over Clermiston Star. David MacIntosh got the opener for the visitors when he headed in a corner and they were soon celebrating again when Conor Glenholmes finished well. Tranent continued to remain in the ascendancy for the remainder of the first half but couldn’t find any more goals to cement their authority. They would do just that after the interval, however, when John Ferguson made it three after a quick one-two with Jack Godsell. MacIntosh then hit his second and third of the match in quick succession to cap a fine afternoon’s work. Vittoria Group hit four past Burgh Vale in their Sunday Morning Division 1 Cup Section A clash at Saughton. The scores were level at the interval, with Vittoria going on to dominate the second half. Marc Hunter was quickest to react after Vale’s goalkeeper spilled Dean Nichols’ cross and then Chaz Burke made it two with a terrific effort from 25 yards out. Saif Qadir and Craig Gunderson then both scored a goal each to put them joint top of Section A with Corstorphine Timbers and Cabrera Athletic.